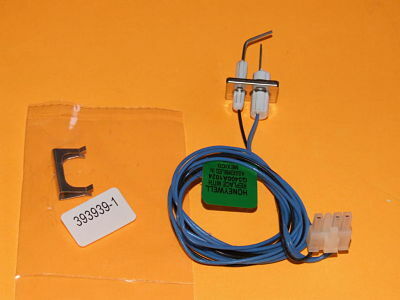 Ignitor-Flame Rod Assembly for Q3450; Q3620; Q3480 Field Replacement ANS Z21.20 Automatic Ignitor System 0747. Used in Armstrong; Coleman; Honeywell; Intercity Products; Lennox; York equipment. Q3400 Pilot Burner Field replacement Ignitor-Flame Rod Assembly for the Q3450 and Q3480 Pilot hardware used with the SV9500; SV9600; SV9600H SmartValve system. Replaces Part Numbers: Q3400A 1024; Q3400A1024; Q3400A; 42640-001; 42640001; 42640-1; 426401; 4103200; Q3400A 1032; Q3400A1032; Q3400A 1027; Q3400A1027; 1009524; 1146856; Q3400A1016; Q3400A 1016; Q3400A 1040; Q3450A 1098; Q3450A1098; Q3450B 2003; Q3450B2003; Q3450C 1805; Q3450C1805; Q3450C 2407; Q3450C2407; Q3450C 3009; Q3450C3009; Q3450D 1001; Q3450D1001; Q3450D 2504; Q3450D2504; Q3450D 2702; Q3450D2702; Q3480B 1009; Q3480B1009; Q3480B 1017; Q3480B1017; Q3400A 1008; Q3400A1008; Q3450E 3004; Q3450E3004; 42490L095; Q3450; Q3620; Q3480; 1009524; GPQ3400A 1024; 342640-001; 1009524; 1149856; 42640001; 1149856; B1401011; B14010-11.